8. Correlation templates calculating correlation matrix, partial correlation matrix, regression linear, polynomial, exponential coefficients, and more. Requires Excel 97 or higher. 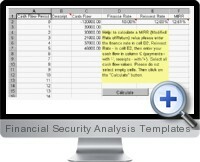 Use of some complex financial functions are simplified by VBA procedures.